It's been a while since I've reviewed any sours here, so it make sense to review Fuggles & Warlock's Rei Boysenberry Sour. I've had the sour in my fridge for longer than I care to remember, but like anything.. I have to check it out! 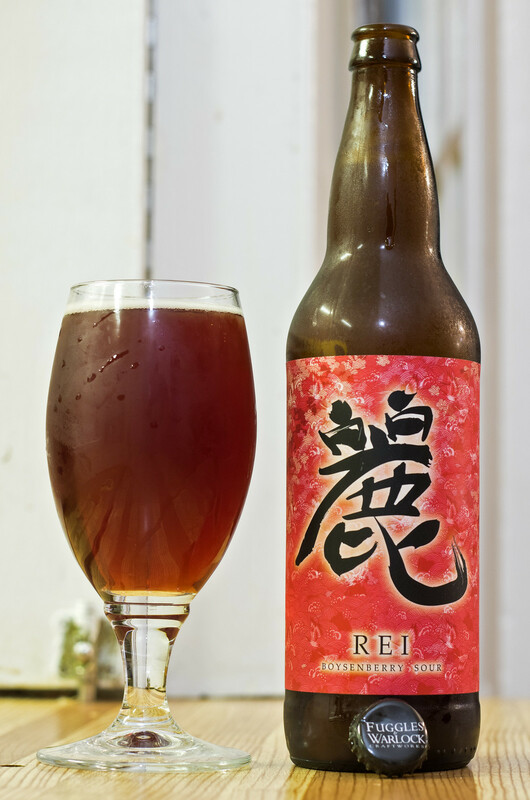 Appearance: Rei's a deep reddish brown body with a light amount of beige head on top. Minimal carbonation. Aroma: Sour with notes of various fruity notes (reminiscent a bit of raspberry and various other fruits), good amount of sour notes that reminds me of a strong, dry red wine, and a touch of yogurt. Taste: This beer is very dry and quite sour right from the first sip. It's reminding me more of a strong, tart Belgian ale or a dry Old World red wine. The sweet fruitiness is pretty much replaced by the sourness of the beer, but there is a certain strange fruity flavour in there that I can only describe as those sugary fruit snacks shaped like cartoon characters from your childhood. The aftertaste is a lingering sour bite tingling the tongue, long after the beer is done. Overall Thoughts: Pretty sour, light amount of sweetness, fairly dry, but pretty decent. In the next few days I'll be checking out their Saskatoon berry sour, it will be interesting to compare notes with this beer! If my buddy Chris at F&W sees this, hey!